This is a Lowel GO Intro Kit. It's a three-light kit based on the V-Light 500-watt floodlight and two Pro-Light 250 watt focusing floods. Powerful enough to light a small room yet small enough to fit in a large pocket, the V-Light can be used as a broad key light, a fill light (with an umbrella or diffusion gel), a backlight, or a background light. It's also excellent for copy work. With its high-intensity #2 reflector and prismatic glass, the tiny focusable Pro-Light is more efficient than a Fresnel of equal wattage, yet it gives an exquisite, even light with Fresnel-like shadow quality. It can be used as a low-level key light or accent light, fill light (with diffusion), or backlight. 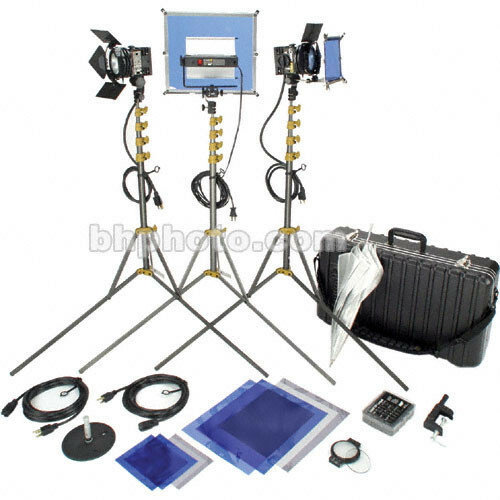 The kit also includes barndoors, gels and gel frame, clamps, light stands and a GO-85 hard kit case.. These fixtures may be operated with other wattages and voltages, with the purchase of optional bulbs and plug adapters. Box Dimensions (LxWxH) 32.0 x 19.0 x 8.0"
GO Intro Kit is rated 4.0 out of 5 by 1. Rated 4 out of 5 by Anonymous from Compact but solid We are using it for checkout to the public for their video productions. The kit is small, easy to carry and put into a trunk, it is not terribly heavy, but seems robust. Be careful of the stands. They are super light weight and will blow over in a stiff breeze.